Today, we dug around and found our WW1 Wings of Glory aircraft...Still good despite half of them still saying Wings of War on their boxes! I used Goering's Fokker DVII, the Albatrosses were run by my solo system. Having only one type of plane being run solo meant only one chart! Rod, sporting one of those cheap sets of glasses you get in supermarkets in front of his normal ones...instant magnification! - very clever! Lawrence used a Sopwith Snipe, and was flanked by Ian's SE5a. My Germans all went straight forward at the start of the game. Rod's SPAD looked like it was going to face a massed attack from the Germans. 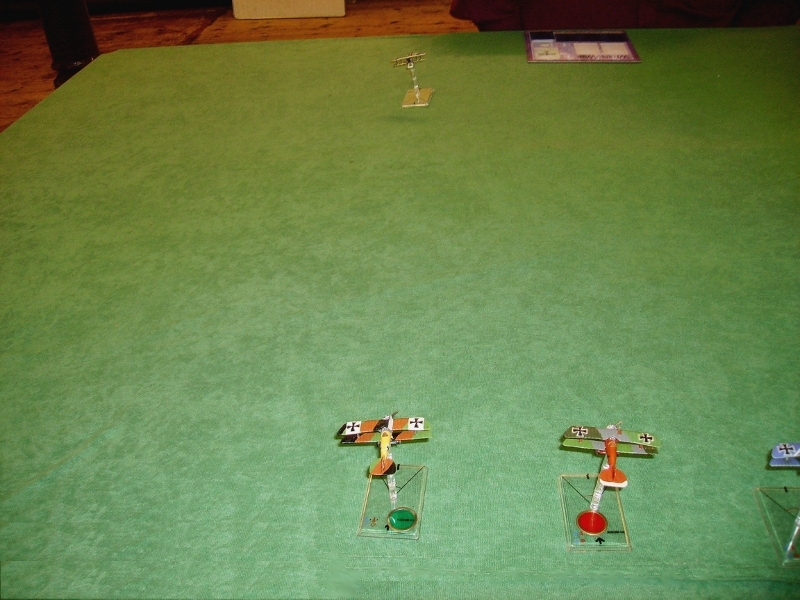 I flew my Fokker round the back of my formation to join in the attack on Rod. Rod, realising he was outnumbered, turned to join the other Allied planes. Poor Rod got shot up by an Albatross! 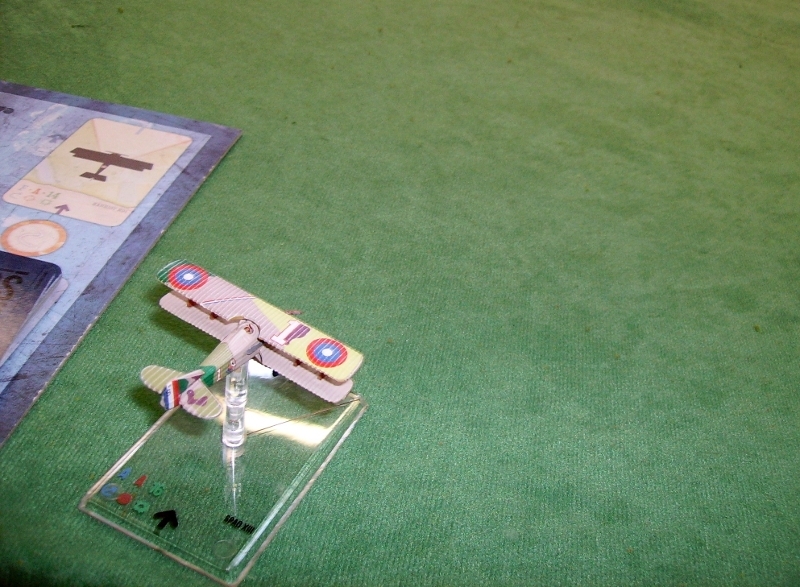 All the planes on table soon joined in, My Fokker missed, but the Snipe hit one of my Albatrosses! One move on, The damaged Albatross sent Phil's SPAD down in flames, the pilot dead at the stick. Ian's SE got a great hit on the 'green' Albatross. The Germans were trying to shoot at the elusive Allies..
..but the Snipe got another good hit on the 'red' Albatross. The last remaining SPAD got a small hit on the Blue wing Albatross. The SE did an Immelmann turn and came nose on to a pursuing Albatross! All the planes now turned and several got shots away. The mass of planes parted, just as quickly, next move! As Lawrence's Sopwith broke away, it was pursued by the 'Blue' Albatross. ..everyone else was left jockeying for position. Another Albatross got on the Snipe's tail. ...but came off worse in the ensuing fire exchange. The poor Snipe was set afire, unable to escape the 2 Albatrosses. Only the intervention by Rod's SPAD allowed the Snipe to get away. But Rod managed to hit the most damaged Albatross, sending it down in flames. With all the Germans massing behind them, the remaining Allied planes flew off table! Rod had done very well for a first game, and escaped alive with a victory to his name! It was a good game, and everyone seemed to enjoy it. We did another game after this, which ended in an even more decisive win for the Germans. I flew a Siemens-Schuckert in this game, which, I decided is no way as good as a Fokker DVII!! !